Greetings, and Happy Spring Equinox! In California, it seems that we are finally having some sort of Winter. Fall seemed to hang on to the very end, and it wasn’t until just a month ago that we got hit with a freeze! The recipe I have for you today is perfect for Spring. It’s light, but still decadent, and can keep you warm on the still chilly nights. I can’t wait to share it with you! While creating this recipe, something wonderful happened. 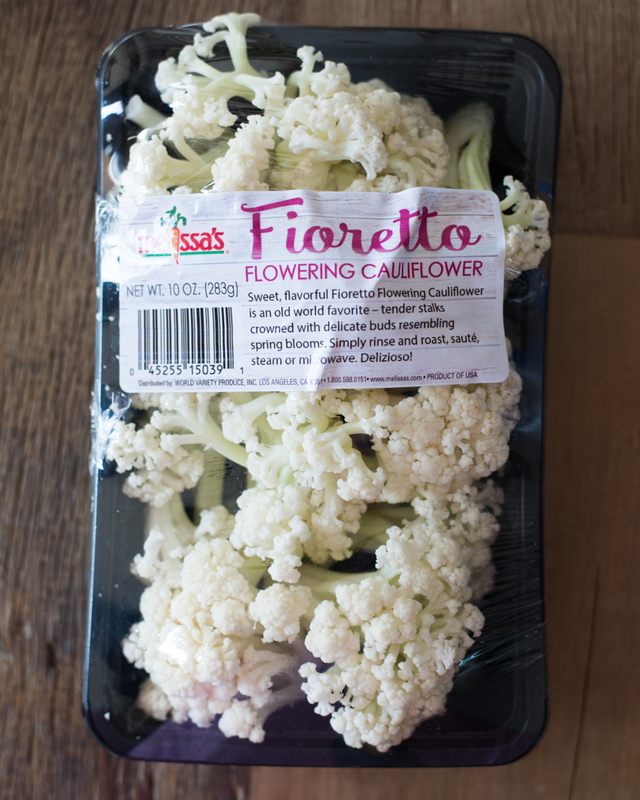 The new Fioretto (Flowering Cauliflower) from Melissa’s Produce was calling my name from the fridge. It was saying, “Remember when Mom used to make creamed cauliflower? 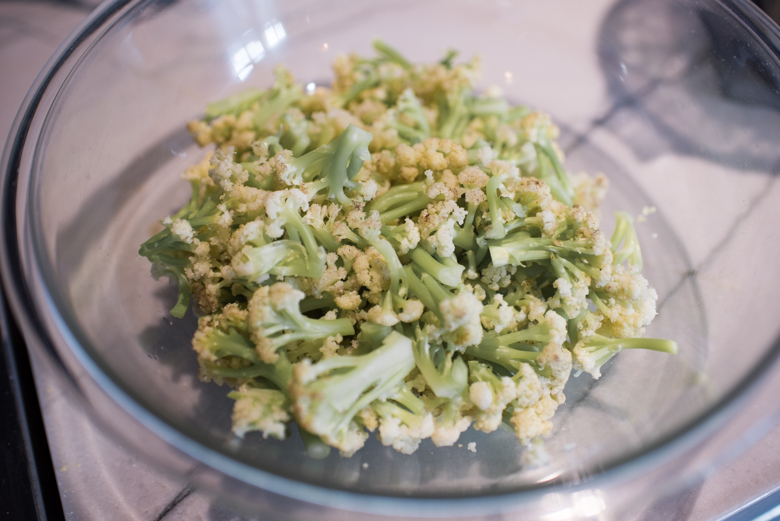 You’ve GOT to do that again!” Creamed Cauliflower. Does anybody remember growing up with that weird dish? I remember liking it, and feeling very un-cool for it. I kept on liking it anyway. We like what we like, right? The last time I had it was honestly, probably 30 years ago, but when challenged with coming up with a recipe for the Fioretto, this dish started nagging at my brain. And so goes the process of recipe development! I had the idea for the creamed cauliflower, but how do I make it 1) – vegan, and 2) more interesting than the original? Well, I instantly thought fresh herbs. Tarragon is such an under-utilized herb, and does go great in cream sauces, so that was a must. Add parsley just because! 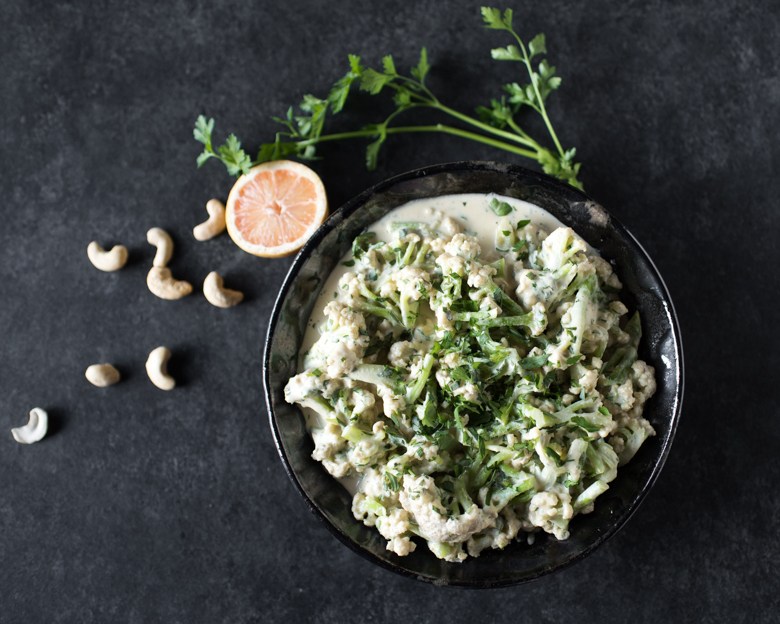 Cashew based cream sauce is a must for the cream factor, with lemon juice to make it pop. Seasonings included nutritional yeast for cheesiness, aleppo pepper for spice, and salt and pepper of course. During the process of putting this together, it was time to adjust seasonings. Still needed a bit more salt. As the warm dish’s steam wafted up to my nose, the tarragon smelled so good. I have a little jar of truffle sea salt on a shelf at eye level, and it was staring at me. I thought to myself that tarragon and truffle might go really well together, so I put some in the dish. Tasted, and it BLEW MY MIND! 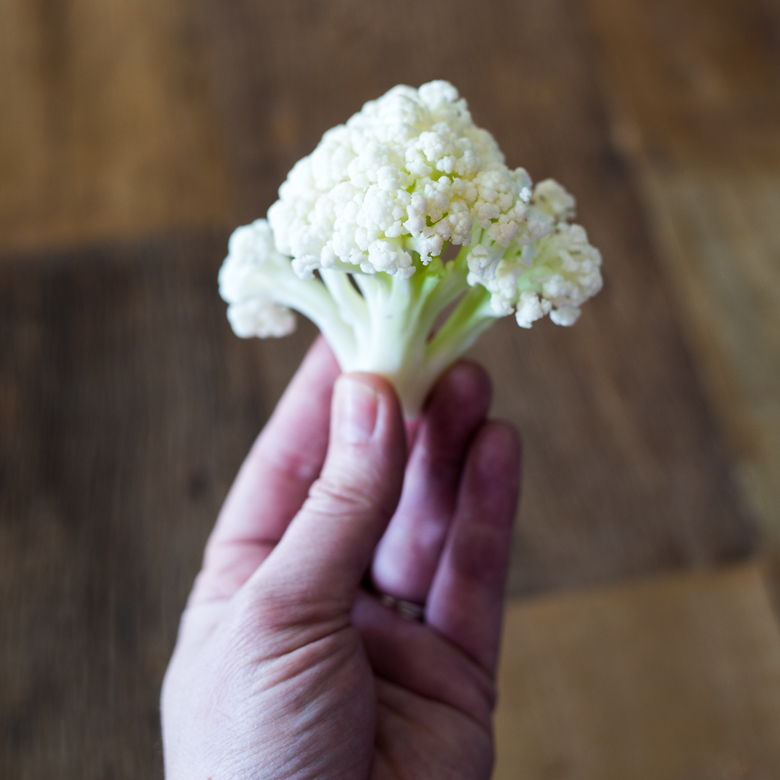 Cauliflower, and now Fioretto is one of those vegetables that initially you think, “meh, what am I going to do with this?” Then, after it’s roasted, broiled, cooked, or whatever, you realize that you could gobble down a whole head to yourself. It took abominable strength to portion these out for lunches the next day, because that tarragon / truffle combination is FIRE! Add in that addictive creaminess from the cashews, and watch out! I hope you enjoy this one, my little devils. If you can’t find the fioretto in your local grocery store, you can use a medium head of cauliflower. The sauce is where it’s at! 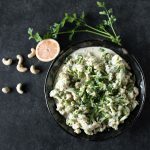 Reminiscent of childhood dishes, this version of "creamed cauliflower" is elevated with fioretto, tarragon, truffle salt, and a decadent cashew cream sauce! Cut Fioretto into bite-sized florets, and steam for 5-7 minutes, or until the florets are tender. Place the cashews, almond milk, and nutritional yeast in a blender, and blend until smooth. 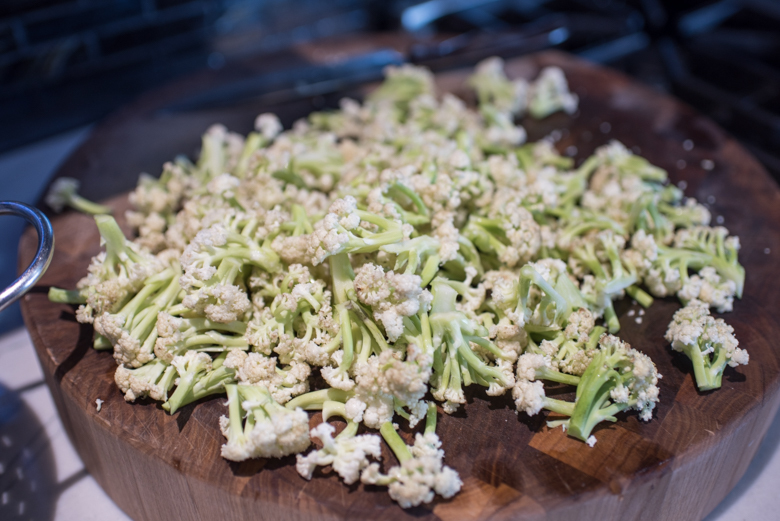 Add the cream to the steamed cauliflower, along with the fresh herbs, truffle salt, lemon zest, juice, and pepper. Toss to coat and serve immediately. While tarragon and truffle salt elevate this dish astronomically, they are not necessary. The cream and cauliflower are a great base to make this dish your own by adding your favorite flavor combinations. If you don't have aleppo pepper, just use regular black pepper. If you want to make this, but can't find fioretto, you can also use a medium head of cauliflower. 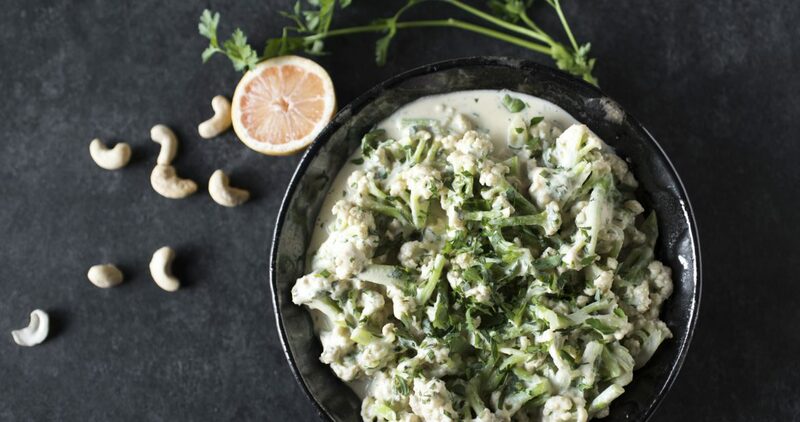 I love creamed cauliflower and I love your twist on this classic dish. Tarragon is the perfect choice in my book for accompanying herb and I am all for trying the vegan version of the cheese sauce. Job well done Natalie! Cathy, thank you so much for your continued support! It means so much!! Brilliant dish! LOVE the flavor combination and the Fioretto is so pretty! Thank you so much, Valentina! My mind was blown with that flavor combination!